A selection of guide blocks at specific angles. 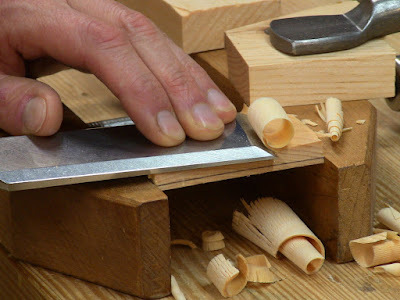 Here I'll show how I made the angled guide blocks used when learning the sharpening process. I experimented with two different methods. Because these blocks are used as references, you want to make them with precision. Any imprecision in their shaping will translate to imprecision in their use. I made these at 19, 23, 25, 28, and 30 degrees, to accommodate my paring chisels, bench chisels, and plane irons. In general, you want about 5 degrees between your primary and secondary bevel guide blocks. 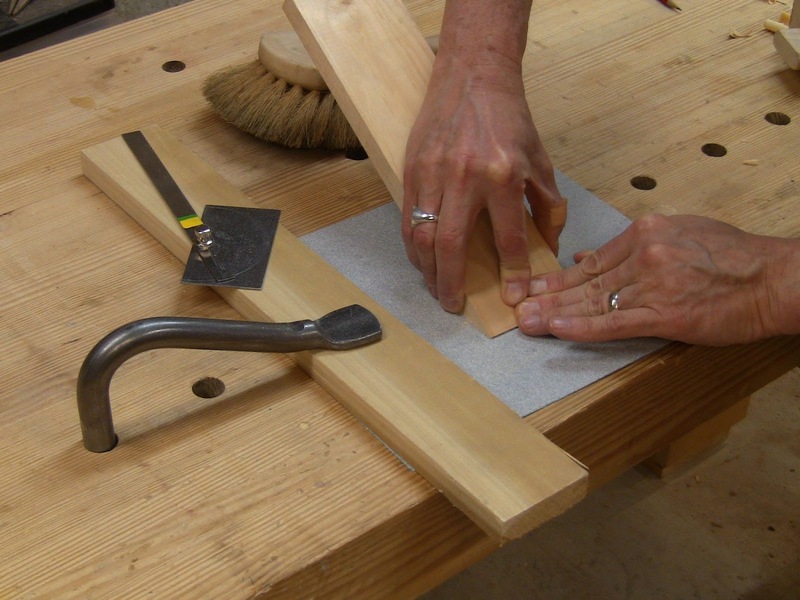 The first step for either method is to lay out the angled face on some prepared stock. 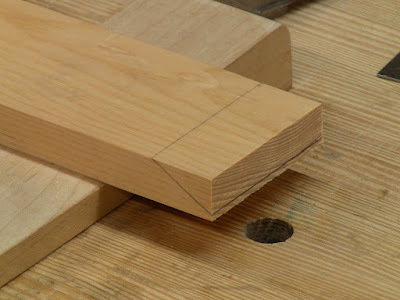 I used 3/4" pine, 3" wide, with a precisely shot square end. I left the piece long for easy handling. Using a protractor, I drew an angled line across the side. This is the bevel angle for the block. 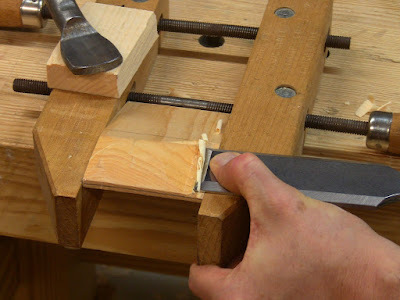 I left the front edge flat so that in use, the tip of the block won't get in the way of the tool on the stone. I squared one across the end grain, and the other end across the face. Then I connected up the end of both squared lines with an angled line on the other side. This outlines a wedge of waste on the end of the piece. The wedge on the block marked for removal. Note that the front is left flat, I don't want it to come to a sharp point. The first method is to pare the wedge off with a chisel freehand. Finish off with a bit of careful sanding, similar to sharpening a chisel bevel on sandpaper. 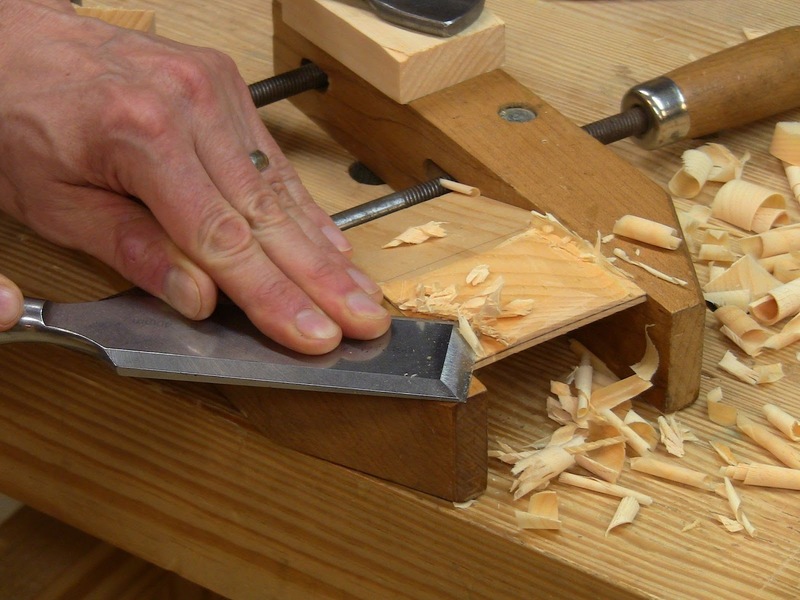 I used my widest chisel, freshly sharpened so that it sheared off smooth, clean shavings. You can certainly do this with a narrower chisel, but the wider the chisel, the better registration you get across the surface. 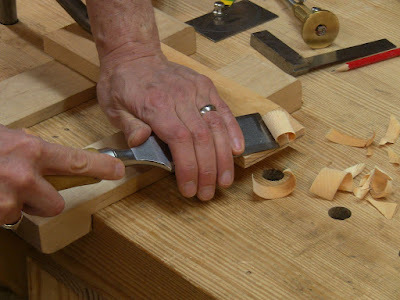 First I relieved the corners working along the grain, to ensure there would be no blowout when I went across the grain. Then I took skewed slicing cuts across the grain, lining up with the block bevel angle. As the beveled surface got wider, it got more difficult to cut, so I took lighter cuts. The good news is this provides a wider registration surface. Side view of skewed slicing cut. The piece is held down in the bench hooks with a holdfast. I did most of this from one side, then turned the piece around and came in from the other side, just down to the line. I turned it around again and took the remainder from the first side, just down to the line. Next, I very carefully pared off little feathers of high spots where the cuts met. Then I secured a sheet of coarse sandpaper to the benchtop, and dragged the bevel sideways down it until I had removed the pencil line all around. This took the last of the high spots down, leaving a flat bevel. Dragging the bevel sideways down a piece of coarse sandpaper. That's the protractor I used for marking out, upper left. Once I had it flat, I cut it to final length and labeled it for the angle. 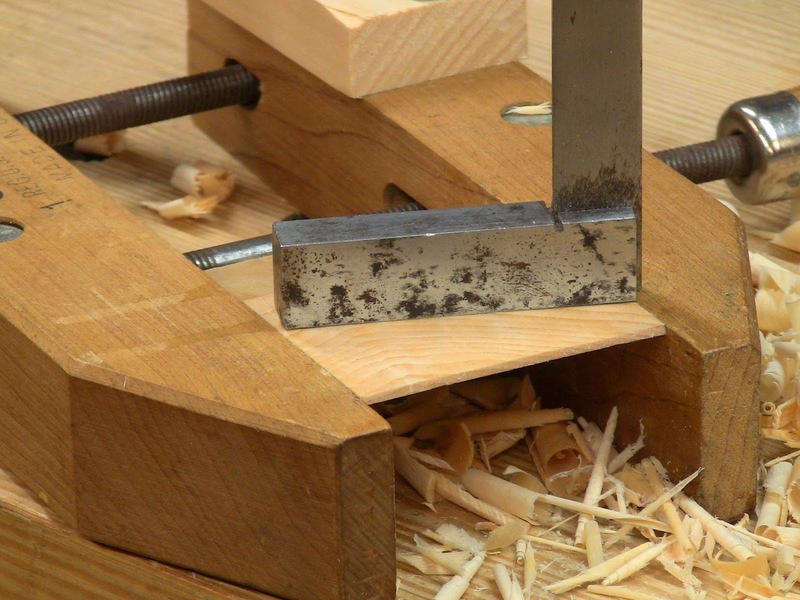 This is a method I got from Chris Schwarz' article on building a saw bench. 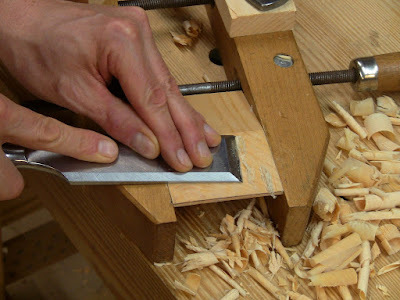 In his article, he does some initial sawing, but this pine pares easily enough that doing it all with the chisel works fine. 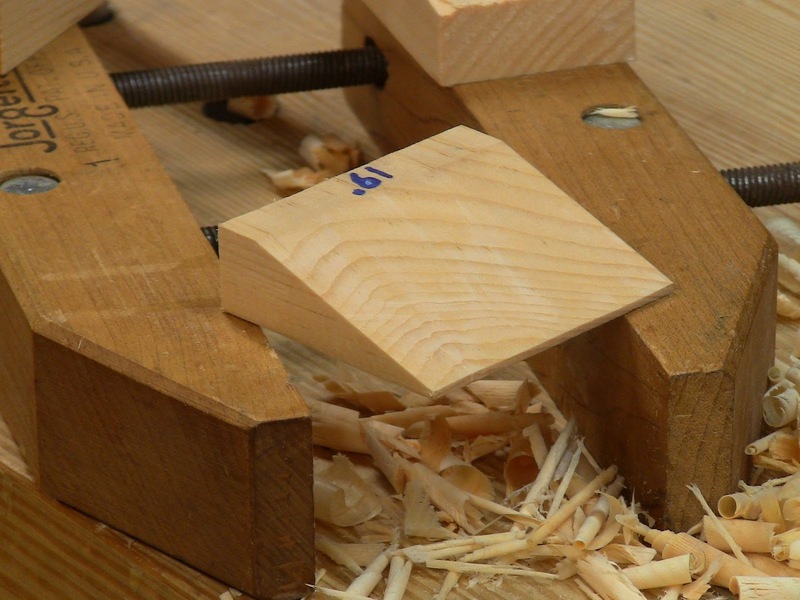 The idea is to use a parallel handscrew as an improvised paring block. After some fiddling around, I found the easiest way to manage this setup was to cut the block down a bit in length, secure the handscrew to the benchtop with a holdfast, then align the piece in it and tighten it up. 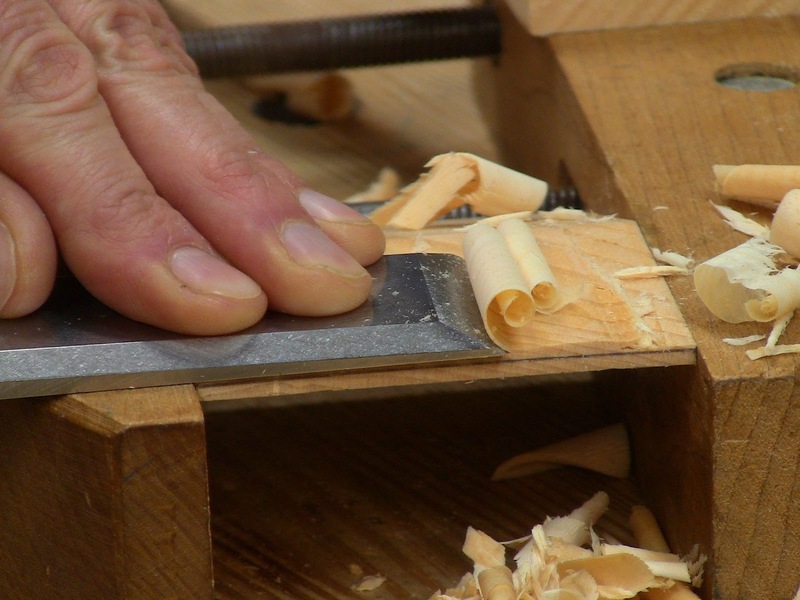 The tightening step is a bit fidgety to get good parallel grip precisely at the lines. But once you do that, the parallel jaws make good registration surfaces for the chisel. Paring flat across them means paring flat across the bevel of the guide block. 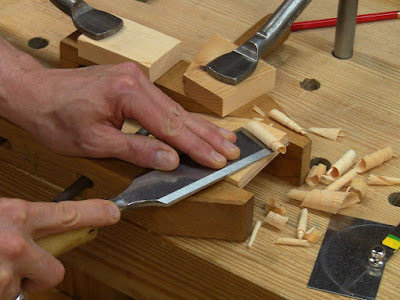 I have a few more pictures of this method, but all of the chisel work shown works with either method. The piece secured in the handscrew, the bevel line aligned to the jaws. Side view, skewed slicing as before. Coming in from the other side, down near the line. 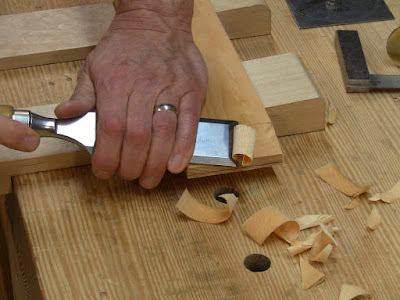 Using just the corner to cut diagonally across the bevel. 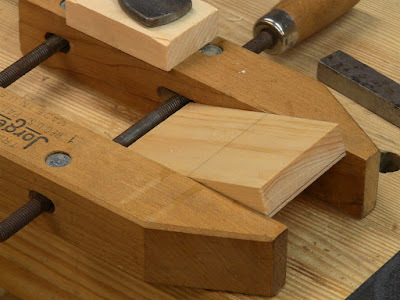 Slicing diagonally, now registering flat on the clamp jaw. 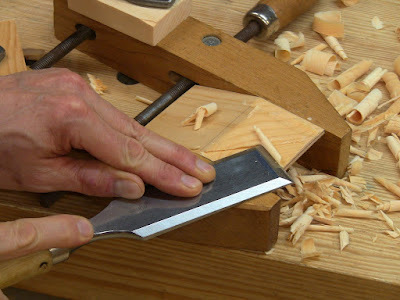 Slicing straight across, being careful to remain parallel to the pencil line. Lightly paring the last few feathers. Checking the surface for flatness. 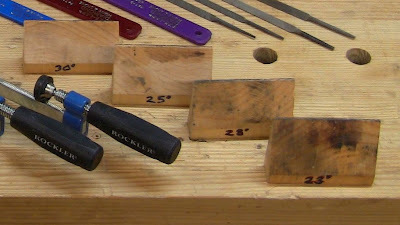 The final block cut to length and labeled. Both methods seemed to work equally well. The second is a good general-purpose technique to know for making awkward, precisely angled faces.